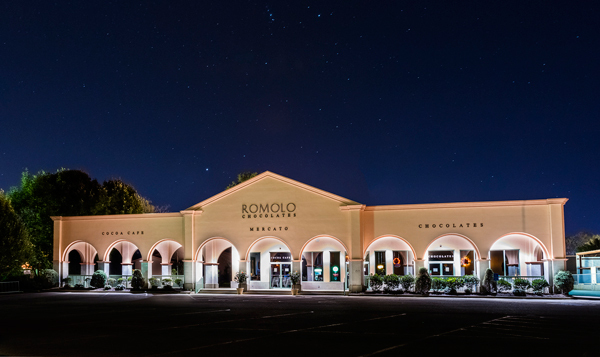 Romolo Chocolates retail store is three stores in one: a chocolate shop, a gift shop and a café. What is really sweet about the chocolate shop and our Cocoa Café is they are theater-style, so visitors watch us make chocolates, cakes and cookies while they shop or sit and enjoy our caffe. Our chocolate shop features artisan confections like hand-made caramels and nougats, bark and meltaway, and Grandpa Romolo’s Famous Sponge candy. We also carry candy we know our customers will enjoy and meet our quality standards like licorice from Australia and real fruit pectin jelly beans. All told, we stock more than 200 confections of the highest quality! Mercato, our gift shop, showcases unique gifts and beautiful plush plus greeting cards for many occasions, giving customers the building blocks for the ultimate gifts (starting with chocolate, of course!). Our Cocoa Café is named for our Signature Cocoa, hand-made and offered year-round either creamy and warm, or “frozen” blended with ice. The café features cookies, brownies, muffins, cupcakes, biscotti, cannoli and more, each carefully crafted and made from scratch from our chocolates, freshly roasted nuts, and farm-fresh butter and eggs. You won’t find treats like ours anywhere else. Customers can also enjoy Romolo Chocolates own line of premium ice creams and milkshakes, as well as coffee, tea and espresso drinks made in the Italian tradition on the Vittoria Arduino Venus Bar, our beautiful espresso machine made in Italy. Open until 10 p.m. every day of Erie’s beautiful summers so customers can relax on our outdoor patio, Romolo Chocolates is a must-enjoy destination for visitors to Northwestern Pennsylvania. Just off the piazza, we also have a fun event space, Sugar, that you can book for your next outing or special occasion. Choose from an array of event options, all of which feature Romolo’s sweet treats. For more information, or to book an event, visit our Sugar page.